In stock - low quantity. Order in the next 8 hours, 16 minutes and it will go out today! 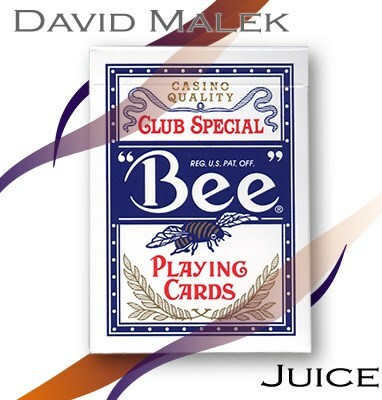 These cards have been marked using a special kind of juice formula. These cards are great for magic tricks and can be seen, by you, from up to 15 feet away. These cards are hard to read and you have to train your eyes to be able to read them. It can take anywhere from an hour to a week to learn to see these markings. Since they are so hard to see it would almost be impossible for a spectator to see. When someone first showed me these cards I was amazed how easily they could tell what number the card was, when I was finally taught how to read them it took me about 2 hours to see them. I have now had these cards for about a year and even the light marks stand out like neon signs. These cards come with full instructions on how to read these marks and how to use them. These cards can not be detected using the infamous riffle test. The harder they look the harder it is to see, even under bright lights and close inspection. You don't need any kind of glasses or special devices, and you do not have to look at them in a strange way to see these cards. Cards like these are used by experts since the marks are impossible to see unless you know the secret. Markings have carefully been placed on the card so that they are extra hard to see (You will know where to look). All cards are marked and have 13 different types of markings showing. Full instructions on how to see the marks and pictures showing where the marks are and what number they relate to. Decks look brand new. These decks can be passed around the table and be inspected before a game or show. Don't be fooled by other sellers that have these cards, with their desperate attempts to make their marked decks look good. We use the best "juice" to mark our cards with and the best and easiest to learn marking patterns. These cards are not intended for gambling purposes, the use of these cards when gambling can get you in a lot of trouble.